Peel carrots and grate them. Heat milk in heavy bottom pan. When milk starts to boil, add grated carrots and ghee to it. Reduce the flame, keep stirring the kheer now and then until you get desired consistency. Now add sugar and keep stirring for 4 to 5 minutes. Chop cashewnuts and almonds. 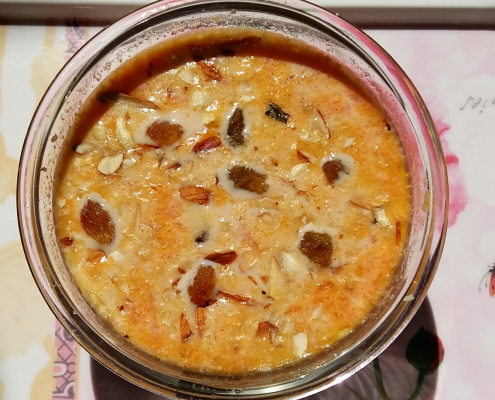 Keep some dry fruits aside for garnishing and add the remaining dry fruits and cardamom powder to the kheer. Dish out kheer and garnish with dry fruits.